(MENAFN - Muscat Daily) What progress has Oman made on its transition towards renewable energy? The promotion of solar energy in Oman and the transition towards a clean energy future has already begun. The Authority for Electricity Regulation and the District Code Review Panel have been successful in ensuring that the regulatory framework and technical guidelines are in place to support the uptake of solar power in Oman and various seminars have raised awareness within local industry regarding the benefits of transitioning to solar power. Oman uses natural gas for the vast majority of its energy needs with over 97 per cent of electricity coming from gas fired power stations. Government subsidies mean that domestic consumers pay only one third of the actual costs of their monthly electricity bills and this subsidy costs the government over RO600mn per year. This is clearly unsustainable given the lower worldwide prices for the oil that Oman produces. It is a fact that the Sun provides more energy to the surface of the Earth in one hour than humanity consumes in one year. Think about that amazing fact for just one moment. All of the Worlds energy requirements for all of our transport, industry, lighting, air conditioning, computers, phones etc, in just one hour of sunlight. Solar power is the only renewable energy source that can keep pace with global energy demands. If we can harness just a fraction of the Sun's power, we could transform our world from one that is driven by fossil fuels and threatened by climate change to one this is entirely fuelled by clean energy. The downward price of solar energy is encouraging businesses to make the transition to solar on a purely economic basis. Payback periods are becoming shorter as the falling cost of solar panels make the investment in solar energy more attractive. The Authority Electricity Regulation have an ambitious programme named SAHIM which will eventually see one third of the homes in Oman have solar panels installed on their roof. This will significantly reduce Oman's dependence upon natural gas for domestic electricity production and the gas saved can be exported at a profit. In May 2008, the Authority for Electricity Regulation (AER) published an assessment commissioned from international consultants of Oman's renewable energy potential with recommendations on how renewable resources might be efficiently and effectively utilised. The study found solar energy density in Oman to be amongst the highest in the world. In May 2017 the AER launched the National Renewable Energy Initiative named SAHIM, a series of renewable energy initiatives to better utilise Oman's abundant year-round solar resource. SAHIM, which means 'contribute' in Arabic, will drive the installation of rooftop solar panels on buildings across Oman. To deliver long term reductions in electricity subsidies. SAHIM 2 will aim to drive the wide-scale deployment of small PV systems (3kWp – 5kWp) for around 10 per cent to 30 per cent of residential Premises in Oman. Unlike SAHIM 1, the costs of procuring, installing, operating and maintaining SAHIM 2 residential PV systems will not be met by Customers but will be met by private sector entities who will recover related costs through contracts with Licensed Suppliers. A tender for the initial batch of houses to install rooftop solar will be floated by the AER in the first quarter of 2019. The SAHIM 2 initiative breaks the funding barrier which has prevented a greater uptake of domestic solar to date. The objective of the SAHIM scheme is to assist in reducing householder's monthly electricity bills by selling excess power generated by the solar panels back to the National Electricity Grid. By structuring the SAHIM scheme this way, the AER has been effective in creating a solar-friendly environment where householders are assisted in funding the cost of the installation of roof top solar which will reduce their monthly electricity bills. Excess power is sold to the grid and shared with other electricity users. 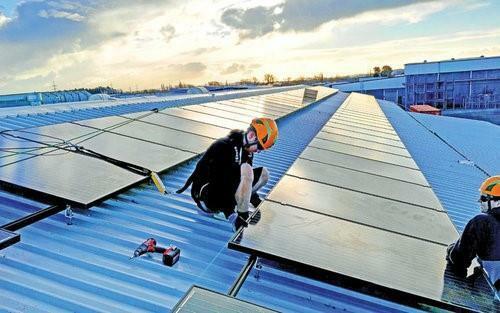 Local SME solar installers will also be heavily involved in the installation of rooftop solar panels and the District Code Review Panel (DCRP) has approved several local SME companies as competent to install solar panels to local regulations. What is the potential for renewable energy in Oman? In the United States, solar energy employs more people than oil, coal and gas combined. Solar energy employed 374,000 people in the US over the year 2015/2016 making up 43 per cent of the energy sectors workforce while traditional fossil fuels combined only employed 187,117 making just 22 per cent of the workforce. The potential for employment in the solar energy sector in Oman is enormous given that the Sun shines for over 340 days per year and the country benefits from extremely high solar density. Oman has been blessed with four natural energy resources of oil, gas, sun and wind. To date Oman has been successful in harvesting only two of those, its oil and gas resources. The remaining two resources of sun and wind remain relatively untapped and they are clean and renewable. Fossil fuels have been the foundation of the nation and will continue to provide the basis of the economy for the foreseeable future. Unfortunately, these resources contribute to global warming and they are finite, when they are used, the cannot be replaced. The challenge now is to harvest the sun and wind and transition towards a clean energy future. The molecules that constitute oil and gas have been exploited, the electrons that constitute sun and wind energy are untapped and they can provide clean, renewable energy and employment for Omani nationals in a new energy sector. It is not by accident that Petroleum Development Oman is considering changing its name to Energy Development Oman. One more amazing fact about our star, the Sun. Solar power is the last energy source that isn't owned yet, nobody taxes the Sun, you don't get a monthly invoice from the Sun for the energy that you receive from it. If only there was some kind of infinite power source that was free to use all day, every day!